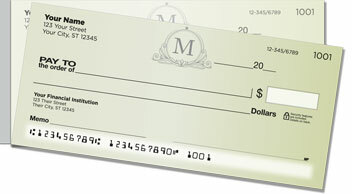 Personalize your new personal checks with an attractive monogram featuring the letter 'M' surrounded by stylish swirling scrolls. 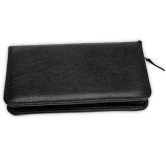 It's an excellent way to add a touch of elegance to your checkbook. The understated beige background creates a classic feel and makes the monogram stand out. This decorative selection is available in all 26 letters of the alphabet - from Anderson to Zigler! If this isn't what you had in mind, you can also add a monogram of your choice to the top left corner of any check design you find online at CheckAdvantage. Look for that option during the checkout process. Make our M Monogram Side Tear Checks yours today! Complete your order with some matching return address labels.